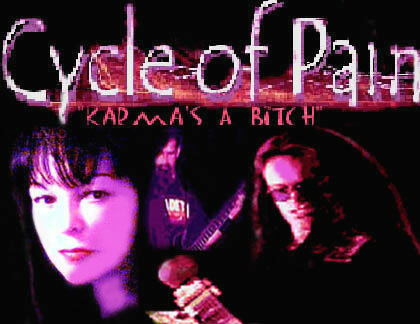 Los Angeles County... though Cycle Of Pain (Karma) is new on the scene, they are not new to the music industry. One thing you can't dub them, is not being familiar with their sport. Coming from the land of hard rock haven, Cycle Of Pain's musicians are seasoned professionals with some having played in bands with members of Rainbow, Black Sabbath, Ozzy Osbourne, Kiss, Quiet Riot, Mercyful Fate, Impellitteri, Dio, Wasp, Whitesnake, Ted Nugent and the list goes on. Back to collaborate with Nita are several of Final Notice's original members, including co-founder, Paul Allen, who was the drummer-backup vocalist. Paul is currently living in Sweden and is Virus 7's frontman with the members of the legendary, Mercyful Fate, lead guitarist Hank Shermann and drummer, Bjarne T. Holm. Paul will sing a duet with Nita and record on a few drum tracks and back-up vocals. On keyboards is Phil Wolfe, who is also an ex-Final Notice member. Phil's played, toured or filmed videos with some of the members of the recognized bands listed above and many more. Phil also works with his beautiful wife, Maria Glass in the rock band, Glass Wolfe and stays busy recording with various artist in his state of the art recording studio. The guitarist for Cycle Of Pain are Alex Zandretta (mp3.com/Terebelam) and Chris Brungardt (mp3.com/ChopsFromHell). Alex Zandretta's video "Vampire Site" and other songs with Alexis Machine and Terebelam have placed 13 Top-40 slots in Goth metal in one day, plus other categories on MP3.com. Alex's love for horror movies consumes a lot of his writing, though writing for the masses and not necessarily for his beliefs. Besides being a virtuoso guitarist endorsed by Seymour Duncan; Chris Brundgardt is also the owner of ChopsFromHell.com. Chris's talent can be categorized with some of the best guitar shredders in the world and they come together and offer instructional videos, articles and much more on ChopFromHell.com. Harry "Hare" Butler is a guitar player turned bass, who first got his start studying under Steely Dan's, Michael Fletch. Hare was formally endorsed by Risson and managed by Dave Duncan of Scotty Bros. Hare's played with punk rocker, Rickk Agnew (Social Distortion, Adolscents) in Yard Sale as a guitarist and with many other known players.